Preamble: Fascist repression can only flourish when the voices of its victims have been brutally silenced and isolated within the concrete confines of a man-made construct where the scrutiny of the media cannot transcend the walls. Those walls are erected by legislative venality and deprive humanity of an eyewitness account of how captured human minds, spirits and bodies are being disfigured by the instrument of officially sanctioned evil that plagues this vortex of torture they call Pelikan Bay. But contrary to the fascist intent, the voices of resistance reverberated within the depths of this concrete hell as New Afrikan revolutionary prisoners since our arrival have refused to remain silent and have waged a continuous campaign to put an end to this racial injustice. And for over 20 years the San Francisco Bay View has played a critical role in allowing our voices to be heard. As a result they themselves have become a target for the CDCR (California Department of Corrections and Rehabilitation) agents of repression, such as the Office of Correctional Safety (OCS), Institutional Gang Investigations (IGI) and Investigations Services Unit (ISU). The confiscation of the March [and, since this was written on April 5, also the April] issue of the Bay View is a clear indication of the agents of fascist repression escalating their attacks against the Bay View. It is imperative for all of us to understand that the Bay View is part of us. Mary and Willie Ratcliff is our sista and brotha and they have sacrificed much to help us and serve our communities. We must now go beyond rhetoric and lip service in support for the Bay View. We now present the following statement: The San Francisco Bay View is a national Black newspaper that serves the interests of the New Afrikan communities inside Amerikkka. Its objective is to always bring attention to the injustice that occurs against New Afrikan people by speaking out against the injustices handed down by the state and federal government, who systematically abuse their authority in order to suppress the voices of the oppressed. For over 20 years the San Francisco Bay View has played a critical role in allowing our voices to be heard. These are the words that Warden G.D. Lewis, C.D.W. Ducart, A.W. Swift, ISU Capt. Barneburg, IGI Lt. Frisk and their subordinates live by when it comes to New Afrikans’ freedom of speech – even after several court victories in respect to our First Amendment rights to freedom of speech, in which the court clearly stipulated in their many rulings that the prison officials were in violation of our First Amendment rights. Brad Ford, a prisoner in the federal system, uses his meager earnings to buy subscriptions for younger prisoners he mentors. The Bay View, denied for three of the last four months to subscribers at Pelican Bay State Prison in California, is currently being allowed in to federal and state prisons around the country and throughout California, except for Pelican Bay. (3) Plans to disrupt the order or breach the security of any facility” and CCR Title 15, Section 3315(a)(2)(C): A serious disruption of facility operations. Yet the officials chose not to provide us a clear 1819 form per CCR Title 15 3136(a), disapproval of inmate mail per each mail item incoming or outgoing. The officials’ actions are calculating and malicious because they deliberately withheld the Bay View paper from the prisoners who actually had been consistent in their litigation against the blatant violations of our First Amendment rights. It was each of us who were not provided the CDCR 1819 forms which we have to have in order to file a 602 appeal grievance form for that which is having an adverse effect on us. In this case, it’s our First Amendment violation governing our incoming mail. By not issuing us our CDCR 1819 form, the CDCR/PBSP (Pelican Bay State Prison) officials are not only denying us our procedural due process but our right to file a civil lawsuit and petition of writ of habeas corpus to the courts for violations of our First Amendment rights. 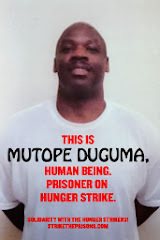 So the CDCR/PBSP official actions are arbitrarily insidious racist attacks on New Afrikan prisoners exclusively and the only New Afrikan newspaper that has chosen to stand up against the CDCR/PBSP’s deliberate threats and power in the interest of the oppressed prison class held in CDCR custody. We also want to say that CDCR/PBSP officials literally ran a test run when they confiscated the 25 Bay View issues in January 2013 from those lone subscribers while giving everyone else their subscription. Only through progressive litigation can we beat back these arbitrarily insidious racist attacks by prison officials who should have never been given authority to run no prison, let alone human beings. We will aggressively continue to attack these actions against our freedom of speech! It is worth noting we have over 15 lawsuits pending in the federal court. Brotha Abdul Shakur has a lawsuit pending specifically pertaining to the confiscation of an article he had attempted to send to the Bay View. The judge in this matter recently ordered the defendants, IGI and ISU, via the attorney general to respond to Brotha Abdul’s lawsuit. He also has a similar petition being reviewed by the California Supreme Court, so we are aggressively challenging the CDCR/PBSP campaign of repression. People, we are all in this battle together. We cannot fight this battle by ourselves, especially from within solitary confinement. We must launch a coordinated effort in our endeavors to protect our First Amendment rights and defend the Bay View against any and all attempts to sabotage its functional capacity and impede their free speech. We will aggressively continue to attack these actions against our freedom of speech! Your support is imperative to our success. establish communication with the primary coordinators for our First Amendment campaign. We are all involved in litigation. Brotha Abdul Shakur has seven active cases presently pending, five Section 1983 civil suits in the federal courts, one in the local superior court, and one under review in the California Supreme Court. Your support is imperative to our success. We are deeply grateful to the Pelican Bay Human Rights Movement First Amendment Campaign and will do all in our power to support them in defending the First Amendment rights of us all. “The degree of civilization in a society can be judged by entering its prisons,” wrote the Russian revolutionary Fyodor Dostoyevsky, who served four years hard labor in Siberia. That truth is beginning to manifest to the U.S. public nationwide and especially in California in a recent flood of mainstream news stories critical of prison policy and practice and the politicians responsible for it. Pelican Bay is on the wrong side of history. Its officials’ fear of the upcoming July 8 hunger strike and work stoppage, a reaction to their refusal to negotiate in good faith over the prisoners’ Five Core Demands issued two years ago, is apparent in their current violations of the laws and regulations that are supposed to govern them. The Bay View has yet to receive any official notification from Pelican Bay State Prison saying why and from whom the March and April issues were withheld. Numerous subscribers, however, have written to say they did not receive their papers. All but one had not been issued the 1819 mail disapproval form, which is prerequisite to their filing a 602 appeal.